On Monday, Nancy Herriman, the author of No Comfort for the Lost, did an author interview with me. I am very grateful that she stopped by! Be sure to check out what she had to say. 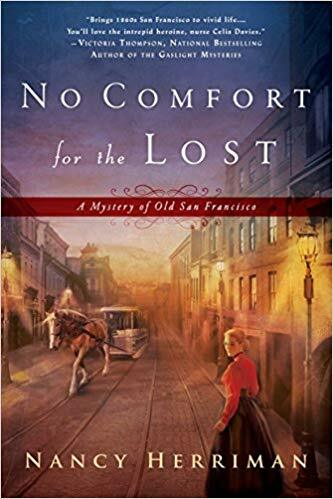 I recently checked out the first book in Nancy Herriman’s new mystery series set in old San Francisco, No Comfort for the Lost. It was pretty good and I will probably keep reading the series as it comes out. After serving as a nurse in the Crimea, British-born Celia Davies left her privileged family for an impulsive marriage to a handsome Irishman. Patrick brought her to San Francisco’s bustling shores but then disappeared and is now presumed dead. Determined to carry on, Celia partnered with her half-Chinese cousin Barbara and her opinionated housekeeper Addie to open a free medical clinic for women who have nowhere else to turn. But Celia’s carefully constructed peace crumbles when one of her Chinese patients is found brutally murdered…and Celia’s hotheaded brother-in-law stands accused of the crime. I recently left my heart in San Francisco, so I’ve been looking for a good Victorian San Francisco mystery series. I was very excited when this one was recommended to me. The book was pretty good, much better than M. Louisa Locke’s series. Celia and Nick are realistic and likable. You care what happens to them. The quality of the writing is very good. The mystery is a little weak. I don’t think it leads you to the denouement very well, but the story keeps you going. It is not quite as good as Victoria Thompson’s Victorian mystery series (the best written), but that is a high bar. Nick’s motive for solving the crime of a woman literally no one cares about (even Celia doesn’t care that much) is not made clear, which I found annoying. The biggest issue I have with the book is the fact that it centers around the murder of a Chinese woman in Chinatown and involves many Chinese characters but focuses on the white people who feel “burdened” with solving the crime. The view point is always that of a white person, either Celia or Nick. Very rarely are the problems that face people of color in literature told from the viewpoint of those people. I long for the day that a Victorian mystery (especially one set in San Francisco) is told from the viewpoint of a Chinese woman. Aside from the awkwardness I felt at the use of Chinese characters, I did enjoy the book. I think you can enjoy media and be critical of it at the same time, as I have said many times on this site. I would recommend this series and look forward to the next installment. Have you read No Comfort for the Lost? What did you think?